A couple of months ago, I started arriving a few hours earlier to work on a few days each week. As an avid breakfast eater, I too frequently reach for foods which aren’t terribly healthy when starting my morning. 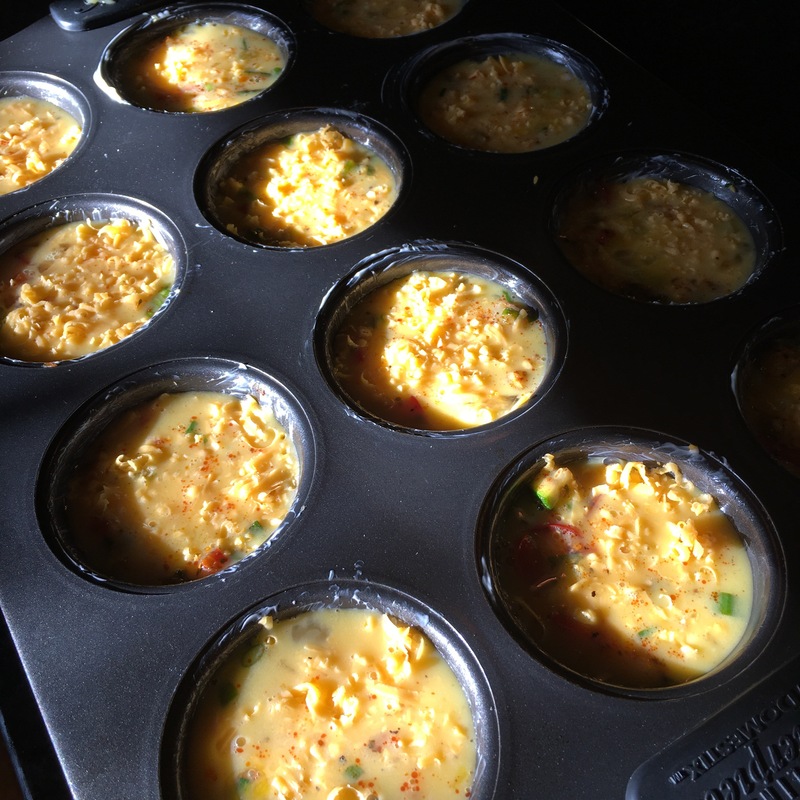 To address the problem, I baked a dozen egg muffins with fresh vegetables on a Sunday to provide a quick healthy breakfast to reheat for those early mornings during the week. I read several recipes before settling on my own creation to include roasted red bell pepper and zucchini, scallions and sharp cheddar cheese. Each of these muffins contains about 100 calories. 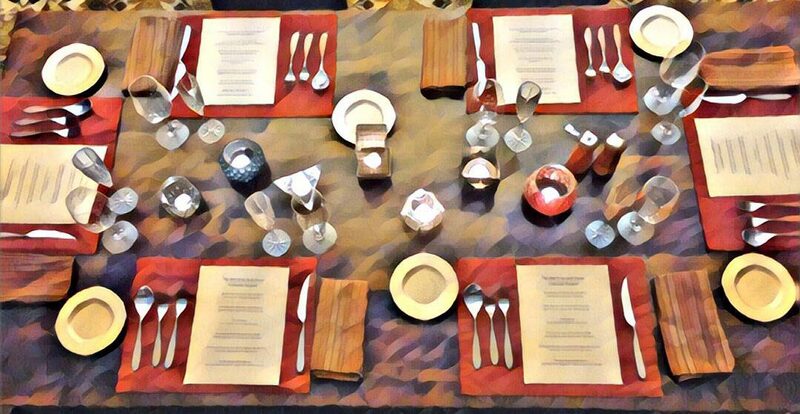 I look forward to trying new combinations. I sautéed the peppers and zucchini to add flavor and cook away some moisture. For my muffin tin, baking the muffins for 20 minutes at 375°F cooked the eggs perfectly without overcooking. After 15 minutes of cooking, watch your muffins to be sure you don’t overcook. The muffins should rise and turn a light golden brown. The eggs will continue to cook for a few minutes after removed from the oven. After cooling, the muffins pop right out of the tin. The rise achieved during baking will flatten as the muffins cool. That’s normal. 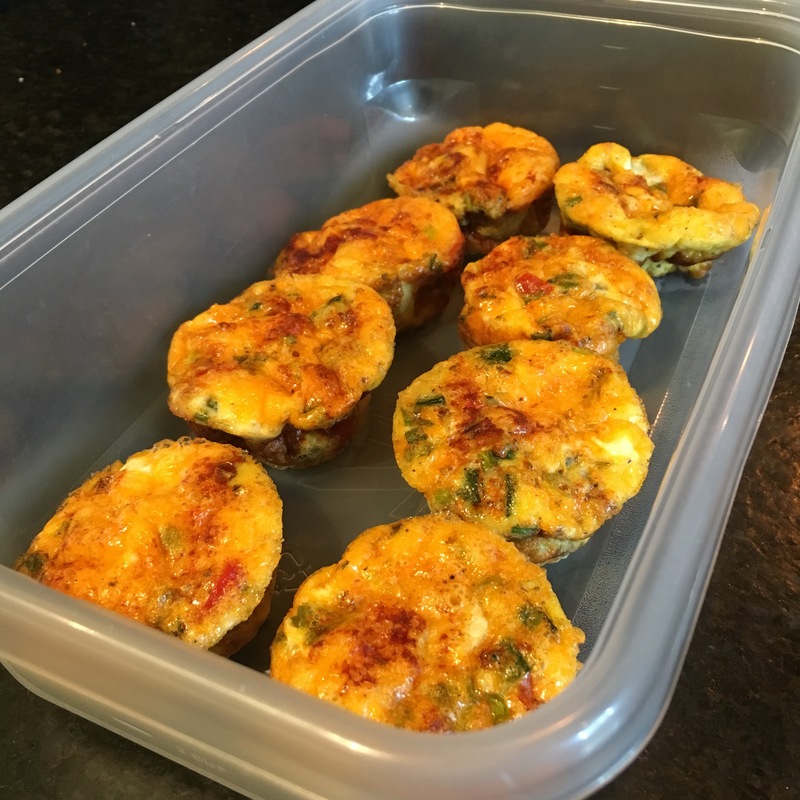 The final texture of each muffin should resemble a frittata. Bring olive oil to a medium heat in a large skillet and add squash, bell pepper, salt, and black and crushed red pepper. Stir for 2-3 minutes. As vegetables begin to soften add dry herbs and stir for 1 minute. Turn off heat and stir in smoked paprika and chopped scallions. Remove vegetables to a plate to cool. Break eggs into a 2-cup measuring cup or a pitcher with a pouring spout. Add milk, salt and pepper and whip until all yolks are broken and mixed. 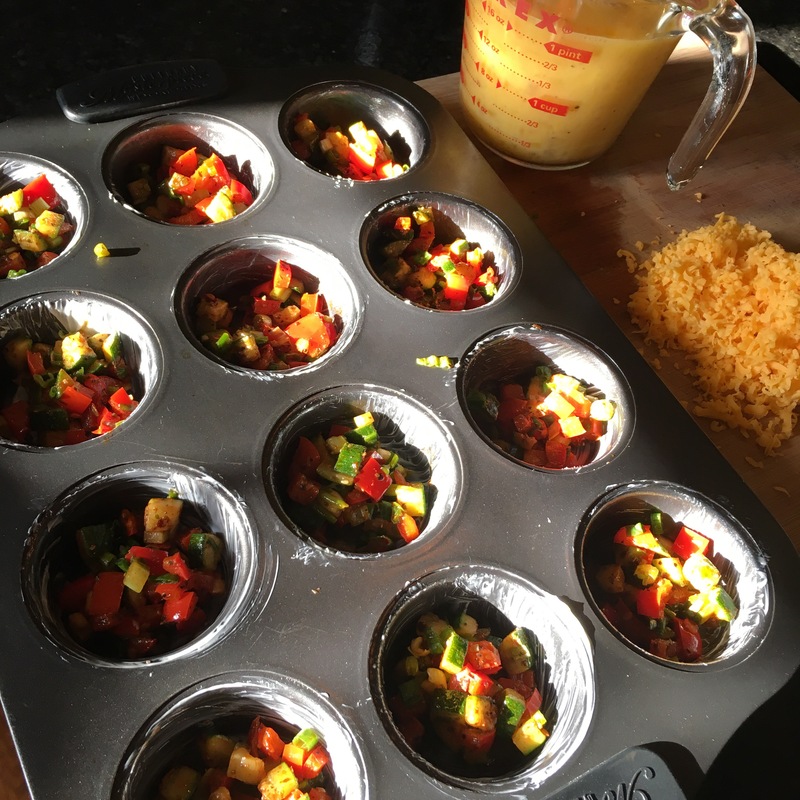 Spoon equal portions of vegetables into each muffin cup followed by equal portions of shredded cheese. Pour egg 3/4 of the way up each cup (any higher and the eggs will spill onto the planar surface of the tin and make a mess as they rise). Gently stir the cheese and veggies to submerge beneath the surface of the egg mixture. Sprinkle a dash of paprika over each cup for color. Place tin on baking sheet on the middle rack of oven to bake for about 20 minutes or until the muffins have risen to a light golden brown. Remove muffins from the oven and allow to cool for at least five minutes before serving. Refrigerate leftovers for 5-6 days. Next Next post: Salade Lyonnaise ou Niçoise?